How Kaya FC must loathe the very sight of Misagh Bahadoran! If there was a football education that Global gave Kaya in last night’s pulsating first quarterfinal of the UFL Cup at the University of Makati stadium, it was to never let Bahadoran run at their defence with the ball at his feet. Not that, it has to be said, in the sort of irresistible form that Bahadoran was in last night, there was an awful lot that Kaya could do about him. Twice, Bahadoran surged into glorious runs with the ball seemingly glued to his laces, weaving – nay, gliding – past defenders with the balance, skill and gracefulness of a ballet dancer. It is probably not too far-fetched an idea to suggest that footballs with different specifications be manufactured to suit the different playing conditions around the world. After all, different balls are used already for futsal and beach football. The first time, in the 35th minute, perhaps Kaya could have closed him down sooner; and indeed, the gap in midfield was too inviting to not take advantage of. Goalkeeper Saba Garmaroudi could not hold on to Bahadoran’s shot; and Demitrius Omphroy gleefully tapped in the rebound for the game’s opening goal while Kaya’s defenders stood flatfooted. The goal momentarily took the fizz out of Kaya, who had been doing most of the running without unduly troubling Global’s pragmatic defence. That it took a 30-yard screamer from leftback Eddie Mallari in first half added time for Kaya to equalise was the most telling indication of where the club has to strengthen to bridge the gulf in class between it and Global. 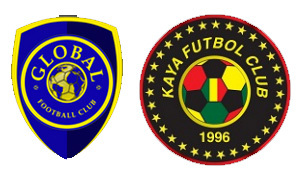 If the first half was played at Mach 2, the second half was a more cautious and subdued affair with Global allowed time and space to knock the ball around the pitch more but with Kaya remaining solid in front of goal. Extra time was inevitable. It took Bahadoran a mere two minutes of extra time to embark on his second glorious run of the evening. While in the first half, he left it to Omphroy to pick the fruits of his labour, this time Bahadoran himself capped the Messi-like run with a fine goal to send Global through to the semi-finals. While the match was totally engrossing and a classic in that it featured two fully committed clubs in a straightforward knockout, the quality of the playing field – or, more accurately, the lack of it – reduced the match for long stretches into a scrappy affair with neither side attaining any real fluency. In many ways, it resembled a pre-Premiership English Third or Fourth Division clash played in winter mud, with the ball played in the air a lot and players launching themselves into full-blooded challenges to win it on the ground. The main difference, of course, is the quality of the ball. Modern footballs are lighter and kinder to the forehead; not to mention easier to ‘bend’ in freekicks. They are more suitable, however, to lush and well-manicured pitches. In last night’s cup clash, for instance, one sort of longs for a good old-fashioned leather Mikasa which stung more if one got hit by a powerful shot and which was less obedient to dead-ball artists. On the good side, on muddy and bumpy pitches, the old footballs tended to bounce less wickedly. Modern pitches are excellent for television; but technology for maintaining them is fairly recent. As recently as the eighties, even Division I pitches in England succumbed to the wintry conditions and fixtures in the mud were all part and parcel of the football season. The heavier football helped to preserve the integrity of games. Even football boots have for the longest time been manufactured for different pitch conditions. While footballs come in all sorts of designs and colours, these are mostly superficial differences and how they behave is more or less standard. Unfortunately, football pitches are not. While the cup clash between Global and Kaya last night was already captivating in itself, it goes without saying that it would probably have been so much better had it been played at the Rizal Memorial.